Hereâ€™s a creative tool for professional webmasters who are looking for the fastest possible way to create high-quality html template and site design that include a foolproof method for splitting images to prevent theft. Visitors are forced to return to the site every time they want to view images and that automatically increases site traffic. Moreover with Image Cut you will make your images load faster and improve site rating on search engines. Every professional web designer knows the routine. 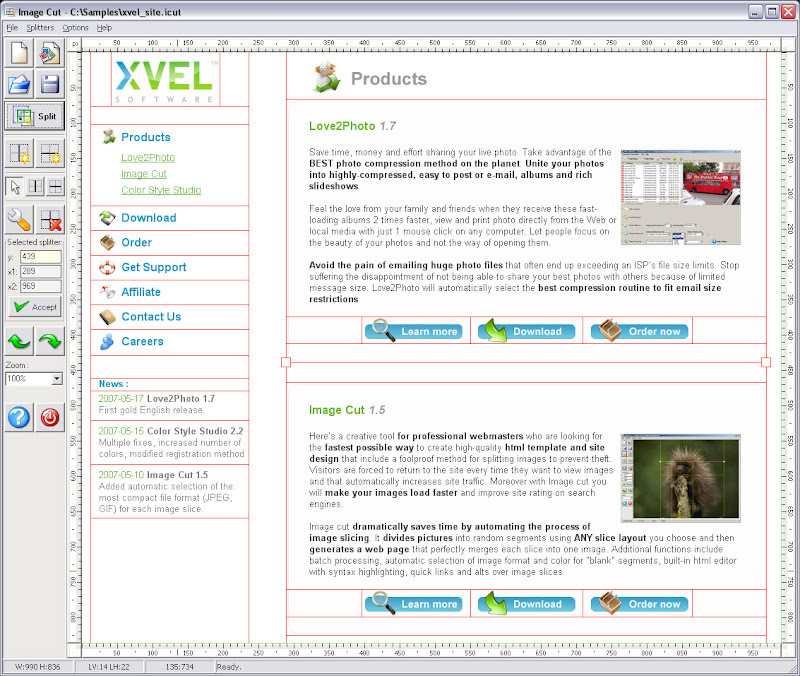 First you design your single image template using your favorite image editor such as GIMP or PhotoShop. Then you split the image template using a cutting tool thatâ€™s capable of creating the HTML to merge each image slice into a complete image. Image Cut automates the image slicing process and saves you hours of time and unnecessary steps. Image Cut does all of the hard work for you. Just place the cut marks on your image right where you want them. 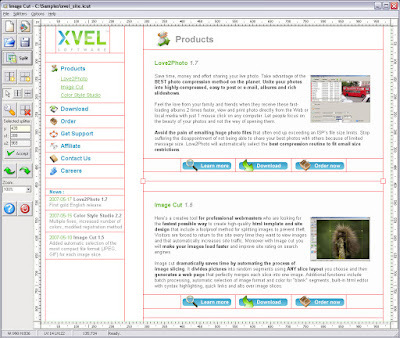 Image Cut automatically saves each slice in an optimized file and then generates the HTML for you. You just drop the files onto your site and youâ€™re ready to go! Optimize web content for quick downloads saving web space and increasing playback speed. Image Cut will automatically choose the most compact file format for JPEG, GIF, PNG and lossless image quality for each picture segment. Even better, you can compare different qualities and resulting file sizes using quick preview and do custom optimizations at will. If a particular segment has no significant data it can be marked as “blank” so no image file is stored. And thatâ€™s ideal image compression! Image Cut is SEO-aware and will help improve your site ranking by inserting ALT description image tags for every image. That means you can add keyword-optimized titles and descriptions for all your images. Quick and painless, Image Cut is designed to make SEO modifications that do their part in helping you achieve maximum site popularity in the shortest time possible. And brings the power of batch splitting of multiple images using an arbitrary cutting template. There is a FREE version you can download. Plus if you order the Pro version they will give you seven E-Books valued at almost $275! How Can I Modify The WordPress XML-RPC System?